Welcome to ANNABEL GREY FABRICS and our collection COTTAGE GARDEN, a range of designer furnishing fabrics suitable for curtains and blinds. Simple floral inspired designs that go from small scale to full width, with a range of colours from subtle and sophisticated to pretty loud and colourful. The Cottage Garden collection is split into 4 designs, Lollipops, Big Daisy, Little Weed and Cut Flowers There is lots of choice in scale and colour within the collection. 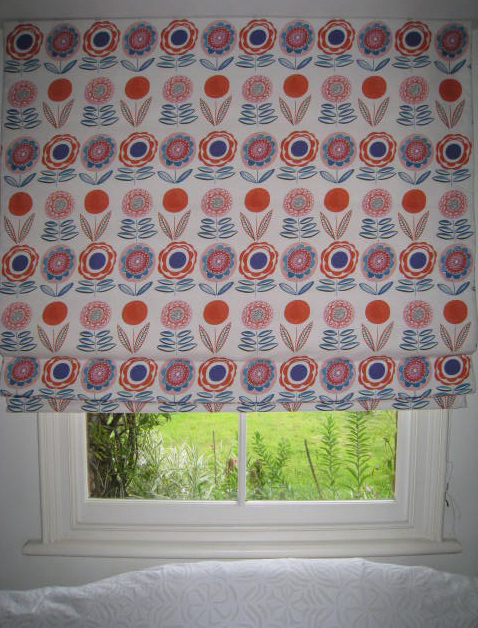 Our main collection of fabric is suitable for curtains and blinds. We can now print fabric for upholstery and cushions but this is a different process and the price per metre is £65.00 so let me know if the fabric is for cushions. This is what my cushions and bags are printed in. Please let me know if it is for upholstery as it will need FR treatments which can be done after printing. Important Information: Please read this before ordering. For oil cloth, if it is in stock, the minimum order is half a metre. For a table cloth you generally need to add 20 to 25cms cms to each end. You can have the exact size but you need to e-mail this order through or call me. For international orders, please contact us about your order before you buy and we will find the cheapest way of sending the fabric to you. All the fabrics are printed on Bleached Linen which is 88% or 100% Linen or Natural Linen Union which is 55% Linen and 45% Cotton. The base fabrics may differ from time to time but will be as close to this as possible. They do look quite different according to the base cloth, more subtle and grey on the Natural Linen and brighter on the Bleached Linen. Where there is a choice be careful to state clearly which base cloth you require. Colours: The colours of the fabrics on the website will look different on different screens and may not exactly match the the original. Small samples are available. You do get odd dots and small marks with digital printing and it is practically impossible to avoid this. SO some marks are expected and have to be forgiven. THE FABRIC IS PRINTED TO ORDER . Delivery Times: As this is a very small business and the fabrics are printed to order please allow at least 4 to 8 weeks for delivery for fabric by the metre. (Although it will probably be sooner). I do have stock of some prints so please ask. All our fabrics should be dry-cleaned only. The reactives which the cushions are in can be washed at 30 degrees but the curtain fabric is dry clean only. A residual shrinkage or stretch of 2% should be allowed in making loose covers and curtains. Our fabrics are sold without any fire retardant treatment but this can be done at the time of printing. Fire retardant treatment is required for fabric used in domestic upholstery and/or in commercial premises. No liability will be accepted for changes in appearance, performance, or defects in any of our fabrics if they are treated after purchase by spraying or processing of any kind, including flame proofing or the application of stain repelling treatments. Fire retardent and other treatments can be arranged by us if required. Where deliveries are made to third parties like curtain makers and upholsterers, on the instructions of the customer, it is the responsibility of the customer to ensure that the correct material is received. We cannot accept claims after the fabric has been cut. Also, no claims will be accepted in respect of any costs of making up. Returns will not be accepted without prior agreement. A 20% handling fee, plus any carriage costs, will be deducted from the credit. ANNABEL GREY FABRICS will not accept returns if: Invoices are dated over 30 days or the fabric has been cut. Fabrics should be carefully inspected prior to cutting. Whilst we make every effort to inspect each order, errors can be made and damage or creasing may occur in transit. Therefore it is essential that no length be cut until you are satisfied with the fabric in all respects. Any claim must be put in writing within 7 days of receipt of the fabric. All goods are supplied by us on condition that our liability for any fault or defect in the quality, condition, description or fitness for any purpose, is limited in amount to a sum not exceeding the purchase price of the particular goods. In no circumstances whatsoever shall ANNABEL GREY FABRICS be liable for indirect or consequential loss or damage. Title to, and ownership of the relevant goods remains the absolute and unencumbered property of ANNABEL GREY FABRICS until full payment is received. Please CONTACT US if something is urgent or you need more information.